Okay, here's the self portrait I've got on my business cards ...not much I know, but I had to put something up since it's been a while between posts. 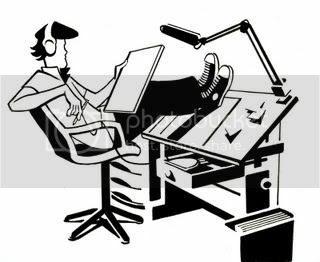 This is actually how I usually sit at my desk when pencilling, even though it looks like I'm bein' lazy, it's what's comfortable. To hell with good posture! I'll try to get some new goodies up here later in the week. 'Til then, thanks for lookin'! Lazy? Actually it looks dangerous to me. Looks pretty good aside from the black hair. Hey man, it's been a while since I dropped in to say hey, so I figured I would end that. Hope all is well.